Generation X, called the "middle child" of generations, includes Americans born between 1965 and 1980. This generation was expected to contribute to the workforce in numbers totaling 65.8 million by 2018. This generation marks the period of birth decline after the baby boom and is significantly smaller than previous and succeeding generations, but it's expected to outnumber Baby Boomers — those born between 1946 and 1964 — by 2028. Millennials from age 18 to 35 nudged Generation X aside in 2015 to make up the largest percentage of the workforce, but the impact of Gen Xers is not to be ignored. Between 35 and 50 years old as of 2015, Generation Xers tend to be more ethnically diverse and better educated than Baby Boomers. Over 60 percent of Generation X attended college. Generation X came of age in an era of two-income families, rising divorce rates, and a faltering economy, although they would eventually enter the workforce during the healthier economic years of the Clinton administration. Women were joining the workforce in large numbers at the time of their births, spawning an age of “latch-key” children. As a result, Generation X is independent, resourceful, and self-sufficient. They value freedom and responsibility in the workplace. Many in this generation display a casual disdain for authority and structured work hours. They dislike being micro-managed and embrace a hands-off management philosophy. The Generation X mentality reflects a shift from a manufacturing economy to a service economy. The first generation to grow up with computers, technology is inextricably woven into their lives. As law firms and corporate legal departments integrate new technological tools, this generation has learned and adapted. 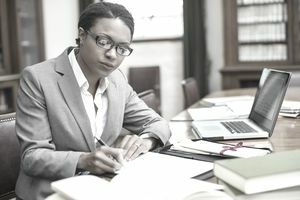 A common characteristic of Gen Xers is their comfort level with PDAs, smartphones, email, laptops, tablets and other technology employed in the legal workplace. Many Gen Xers lived through tough economic times in the 1980s and saw their workaholic parents lose hard-earned positions. They tend to be less committed to a single employer as a result. They're more willing to change jobs to get ahead than previous generations. They adapt well to change and are tolerant of alternative lifestyles. Generation X is ambitious and eager to learn new skills, but they like to accomplish things on their own terms. Unlike previous generations, Generation X works to live rather than lives to work. As of 2010, their assets were statistically double their debts. Compare this to those born during the more frugal years of the Depression and World War II -- this generation's assets were valued at 27 times their debts that same year. Gen Xers appreciate the fun in the workplace and espouse a work hard/play hard mentality. This generation's managers often incorporate humor and games into work activities. What Happens When a Subordinate Employee Harasses Their Boss? How Can Lawyers Dress for Success? Bullying in the Workplace—What Can You Do When It Crosses a Line? Is Outsourcing an Option for Your Law Firm? As a Lady Lawyer How Are You Supposed to Dress? Excellent Question.